U.S. stock futures point to sharp losses for Wall Street on Tuesday. U.S. stock futures pointed to sharp losses for Wall Street on Tuesday, Feb. 20, as investors braced for nearly $260 billion in new debt auctions that could push bond yields higher and reignite a new round of volatility in global markets. Contracts tied to the Dow Jones Industrial Average declined 174 points, while those tied to the S&P 500 fell 17.50 points. The big story this week could be the market's reaction to $258 billion in new debt sales from the U.S. Treasury, which kicks off Tuesday with an auction of $151 billion in short-term Treasury bills, and their impact on an already bearish bond market. Benchmark 10-year note yields rose early Tuesday to 2.915%. Home Depot Inc. (HD - Get Report) posted fourth-quarter adjusted earnings of $1.69 cents a share, 8 cents above estimates. Revenue in the quarter was $23.88 billion, up from $22.21 billion a year earlier and ahead of forecasts of $23.66 billion. The home-improvement retailer said it expects sales growth of 6.5% in fiscal 2018 and comparable-store sales growth of 5%. The stock rose 2.4% premarket trading. Walmart Inc. (WMT - Get Report) earned $1.33 a share on an adjusted basis in the fourth quarter, below analysts forecasts of $1.37. Revenue was $136.27 billion, higher than estimates. U.S. same-store sales in the quarter rose 2.6%. The world's largest retailer said it expects earnings per share in 2019 of $4.75 to $5. Shares of Walmart tumbled 6.5% in premarket trading. The Dow and the S&P 500 finished higher on Friday, Feb. 16, but were dented by the news that a federal grand jury had indicted 13 Russian nationals and three Russian entities accused of interfering with U.S. elections. The Dow gained 19 points, or 0.08%, to close at 25,219. The S&P 500 gained 0.04% on Friday but the Nasdaq declined 0.23%. For the week the Dow jumped 4.25%, the S&P 500 gained 4.30% and the Nasdaq climbed 5.31%. Stock markets in the U.S. were closed Monday, Feb. 19, for the Presidents Day holiday. 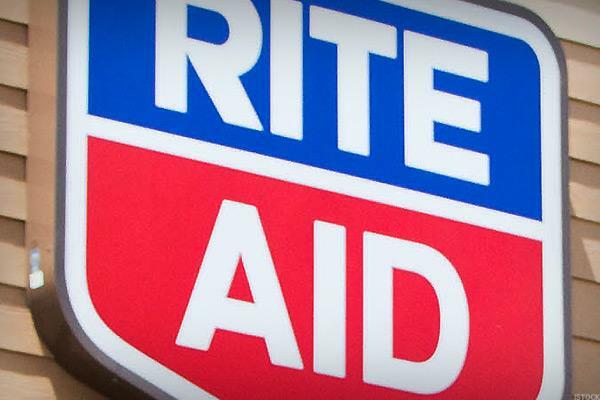 Rite Aid Corp. (RAD - Get Report) shares surged Tuesday after the drugstore chain said it reached a merger agreement with Albertsons Cos. in a deal the pair estimated could generate $83 billion in revenue. Rite Aid shareholders will have the right to exchange 10 shares for 1 Albertsons share, as well as $1.83 in cash, or 1.079 Albertsons share, the companies said in a joint statement. Albertsons would own around 72% of the combined group, the companies said, but will be run by current Rite Aid Chairman and CEO John Standley. The group will have 4,900 stores, 4,350 pharmacy counters and 320 clinics across 38 states, the companies said, with one-year pro-forma adjusted earnings of $3.7 billion. Rite Aid shares jumped 25.8% in premarket trading. Shares of HSBC PLC (HSBC tumbled 4% on Tuesday in London after Europe's biggest bank missed analysts' forecasts for its full-year earnings and said it plans to raise as much as $7 billion in new capital before it will consider any share buybacks. The London-based bank, which is gradually shifting its focus to markets in Asia under the stewardship of new CEO John Flint, said full-year profit more than doubled to $17.2 billion, but the figure was compared with 2016 which included major restructuring costs. Analysts expected the bank to earn $19.2 billion. The bank also booked a $1.3 billion charge related to the new U.S. tax law and $188 billion in bad-loan impairments linked to two corporate clients in Europe that are widely believed to be the scandal hit furniture retailer Steinhoff International Holdings NV and Britain's bankrupt outsourcer Carillion PLC. A Hyperloop linking Washington D.C. to New York -- shuttling passengers between the two cities in just 29 minutes -- is one step closer to reality after Elon Musk's Boring Company received a permit for preliminary excavation work at a fenced-in parking lot in the city, the Washington Post reported. The company told the newspaper that the location could one day house a station in a Hyperloop system connecting cities. Musk, the CEO of Tesla Inc. (TSLA - Get Report) , and a team of engineers designed the Hyperloop, a high-speed transportation system in which capsules travel on supersonic air bursts in reduced-pressure tubes. The system seeks to make traveling between nearby cities faster and cheaper than already available options. Back in July, Musk tweeted that the Boring Company had received what he called "verbal government approval" to build a tunnel linking New York, Philadelphia, Baltimore and Washington. Most of the 900 KFC outlets in the U.K. and Ireland were forced to close on Monday because of a shortage of chicken. The company apologized to customers, blaming "teething problems" with its new delivery partner, DHL. KFC first apologized for the problems on Saturday, Feb. 17. In an update Monday, it listed almost 300 stores as open, but did not say when the rest might join them. In a tweet, KFC, which is owned by Yum! Brands Inc. (YUM - Get Report) , tried to make light of the situation. "The chicken crossed the road, just not to our restaurants," KFC's United Kingdom and Ireland division said on Twitter. "We've brought a new delivery partner onboard, but they've had a couple of teething problems -- getting chicken out to 900 restaurants across the country is pretty complex!" This article has been updated to include earnings from Walmart.